Bell Shakespeare, Canberra Theatre Centre, June 15. IN an air raid shelter during the Blitz in London, some young people delve into bookshelves and pull out Shakespeare. Their stage is a room with a blackboard and some rackety shelves, their costumes nothing more than what they can put over their school uniforms. As sirens blare and bombs fall, they put on a play about war. 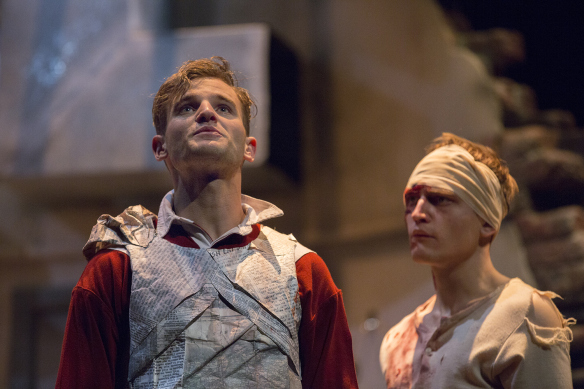 Michael Sheasby and Darcy Brown in Henry V. Photo: Michele Mossop. There could be few productions of Henry V scrappier, less heroic or more affecting than this. Essentially a bunch of kids in a confined space put on accents and lark about, yet the simplicity and intimacy pierce the heart as surely as King Henry’s archers at Agincourt routed the French. Director Damien Ryan sees nothing worth exalting in Henry’s pursuit of conquest. He sees the damage and the never-ending trail of misery. This entry was posted in Uncategorized by deborahjones2012. Bookmark the permalink.